College students no longer need to hit the gym to pedal an elliptical or exercise bike. 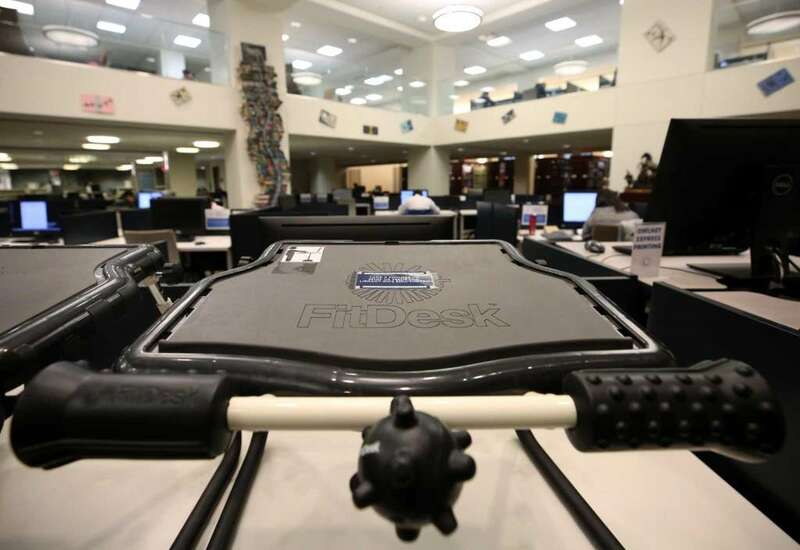 At Texas A&M and Rice universities, students can get their cardio at the campus libraries. The colleges spent about $3,100 combined on desk bikes and under-desk pedals this year, part of a growing effort to keep libraries relevant to a generation of students for whom information never has been bound to a dusty book. The adjustments are part of a dramatic reshaping of the very definition of a library for students and other visitors. “Libraries typically used to be the gatekeepers to knowledge – in the olden days, the stacks were closed,” said Susan Goodwin, associate dean for user services at A&M. “Now, I see us as a gateway. We are facilitators to bring (students) to other experts.” Campuses across the state are pouring money into renovating libraries, adding study rooms, café-like booths and, yes, exercise machines so students can multi-task while studying. Librarians have shuttled books off-site as circulation has dropped, opening up floor space for clubs to gather or for makerspace centers to build electronics or use a 3D printer. A need for libraries to innovate, of course, is not exclusive to college campuses. Municipal and county libraries across Texas and the country have swapped bookshelves for computers, added cafes and provide a slate of community events in a bid to make them more attractive for today’s consumers. Along with the under-desk ellipticals, Rice has added standing desks and a room for nursing mothers this year. Students low on cell phone juice can check out a charger from the library, and if it rains unexpectedly, umbrellas are available for loan. Changing, too, are the functions of the library staff. The University of Texas at Austin hired a data management specialist to work with campus researchers. A&M’s librarians no longer expect to answer questions that can be Googled. Now, they teach visitors how to navigate online databases or answer deep, subject-specific research questions. So far, college libraries’ efforts to stay relevant appear to be effective. Sixty-four percent of students surveyed in 2015 by EBSCO Information Services, a library consulting company, said they used library resources for research.